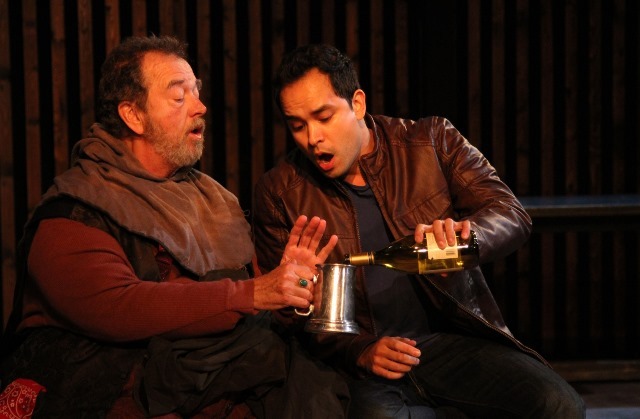 A striking image hovers above the action in Henry IV, Part One at The Antaeus Company. It is a partial rendering of the planets orbiting the sun, which serves as an ever-present reminder that this is the journey of a king-in-the-making. As Prince Hal, also known as Harry, slowly transitions from party boy to royal warrior, its glow becomes more and more noticeable until it finally overtakes the stage. It is simple, but incredibly effective, and shows how powerful the relationship between designers’ work – in this case François-Pierre Couture (scenic) and Michael Gend (lighting) – and the play itself can be. Visuals like these reap great rewards in an intimate theater. Henry IV, Part One is the second in a series of four works that are among Shakespeare’s History plays (Richard II, Henry IV, Parts 1 and 2, and Henry V). Collectively, they follow the line of succession from the deposition of Richard II and King Henry’s ascent to the throne, through the rise to power of Henry’s son, Prince Harry, who will become Henry V.
At the top of the play, there is unrest in the kingdom. While the Percys plot to overthrow King Henry (James Sutorius), Prince Hal (Ramón de Ocampo) carouses with Falstaff (Gregory Itzin) and the Eastcheap gang, indulging in drink, practical jokes, and all manner of behavior unbecoming a future king. What no one knows except Hal, however, is that this is all part of his plan; one that he hopes will endear him to the people he will one day rule and also help him understand them. The scenes in which Falstaff figures prominently provide comedy of the first order and Itzin knows how to spin a situation to his benefit while bumbling humorously through the plot turns. He’s a drunken forgetful slob of a man, and though much of the comedy plays at his expense, Itzin is still as heavy with melancholy in his common world as Sutorius is in his royal one. Unfortunately, pacing suffers due to his constant stuttering and swallowing of phrases and the play begins to drag. Indeed, the overall tone of director Michael Murray’s vision is quite somber but several dynamic performances and an exciting climactic battle scene make this an excellent study of the machinations of war. Detailed text analysis, clear diction, and fully supported voice work are hallmarks of an Antaeus production and this is no exception. The company also continues its typical partner casting; two actors for each role (check the website to see the schedule for each 12-member cast) and everyone but Itzin, Sutorius, Ocampo, and Joe Holt (as Hotspur) plays multiple roles. Keeping them straight isn’t a problem but having Desirée Mee Jung portray both the high-born Lady Percy and then the simple 1st Carrier (the “Anon” scene) in back to back scenes is jarring. In a welcome shift from the burden of war, Mortimer (Adam J. Smith) plays guitar while his wife Lady Mortimer (Tro Shaw) who only speaks Welsh, sings a sweet song in one of the play’s few tender moments. It is as lovely as it is hypnotic and no eye strays from her. There is also strong character work by Tony Amendola as Worcester and Joe Hulser in a double turn as Westmoreland and Glendower. Peter Bayne’s searing sound design and original music amplifies the intensity of the stakes until the tension peaks on the battlefield under blood red lights. Ken Merckx’s athletic fight choreography boldly punctuates the final struggle for power as the victor emerges. This powerful interpretation of the making of a king more than succeeds in the hands of a capable Antaeus ensemble. It is boldly drawn, with import in its bones, and a gravity that befits its subject. If “the time of life is short, to spend that shortness basely” know that yours could never be wasted in the audience of this fine company. HENRY IV PART ONE is double cast. For the performance dates of each cast, go to www.Antaeus.org.